Good monday everybody ! Hope you're all having a great start of the week ! As you probably know, I love the classic combination of black and white but sometimes adding a touch of color can give an outfit a more charming and modern vibe. So I chose this royal blue bag and I think the result is pretty nice. What about you ? Love the outfit and the color of the bag. It's a perfect combo! You look very nice in that outfit! Hello,Ciao...nice photos and your look is very charming...breathtaking Beauty! Gorgeous bag and incredible shoes! 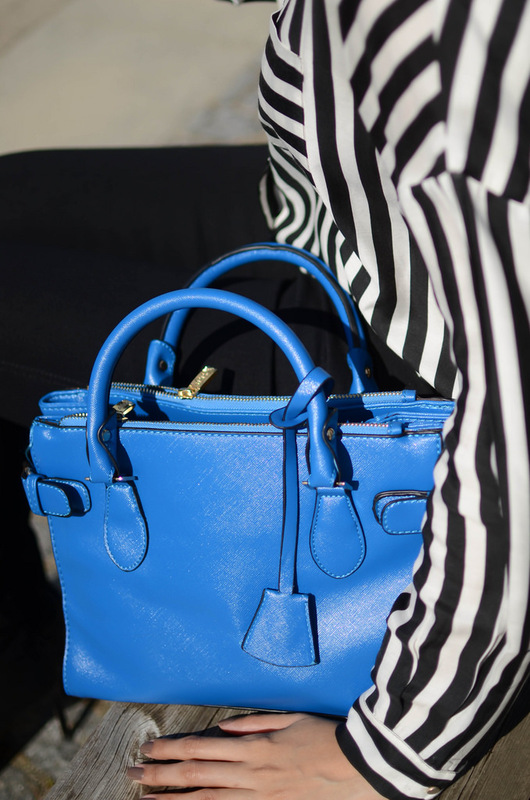 Love the bag, great pop of color to this b&w combo! Fabulous outfit I love it and all the rest of your outfits too! Thank you for the comment on my blog it was kind of you! Love your blog, too cute! Love all the look, the bag is so nice!